LESSON IX - THE LITTLE HORN AND THE JUDGMENT. - Daniel 7. Lessons From the Book of Daniel LESSON IX – THE LITTLE HORN AND THE JUDGMENT. – Daniel 7. LESSON IX – THE LITTLE HORN AND THE JUDGMENT. – Daniel 7. (a) How many beasts did Daniel see in his vision? (b) What kingdoms did they symbolize? (c) Into how many kingdoms was Rome divided? (d) By what were they represented? 3. What did it do? Verses 8, 20, 21. 10. What solemn event is brought to view in close connection with this? Verse 26. 11. Describe the judgment as seen by the prophet. Verses 9, 10. 14. What was given him? Verse 14. 15. Who shared with him in this kingdom? Verse 27. 16. How did these solemn scenes affect Daniel? Verse 28. 17. What did he do? Verse 28. 1. THE little horn of this chapter symbolizes the Papacy. It came up among ten kingdoms, and plucked up, or destroyed, three of the ten to secure its position of supremacy. The ten kingdoms of the Roman Empire arose between the years 351-476 A. D. The three kingdoms which were destroyed to make way for the Papacy were as follows: The Heruli, in A.D. 493; the Vandals, in A. D. 533; and the Ostrogoths, in A. D. 538. Justinian, the Roman emperor, in A. D. 533, made the bishop of Rome the head over all the churches, and the corrector of heretics. The Ostrogoths opposed the claims of the bishops of Eome, hence the will of the emperor could not be carried into effect till the Ostrogoths were subjugated. 2. THE cunning, shrewdness, and the sharp policy of the Papacy is represented by the little horn having eyes like the eyesof man; and as this power was to he a blasphemous, persecuting, law-changing power (see verse 25), Paul calls it the “man of sin,” who opposes and exalts himself above all that is called G-odor that is worshiped. 2 Thess. 2 : 1-4. 3. THESE verses clearly show that the Papacy will exist as a persecuting power when Christ comes the second time. The beast goes alive into the late of fire. It will be a living, persecuting power at that time as much as the two-horned beast or false prophet. (See Dan. 7 : 11; Rev. 19 :19, 20.) One of the heads of the beast, the papal head, would receive a deadly wound (Rev. 13 :1-3), and thus its persecuting power would he taken away for a time. This deadly wound was given in 1798, but it will be healed, as declared in the same scripture and then its persecutions will be revived. “Romanism in the Old World and apostate Protestantism in the New will pursue a similar course toward those who honor the divine precepts.”—Great Controversy, vol. 4, p. 445. Hence it will have the power to persecute, and it will use it. 4. 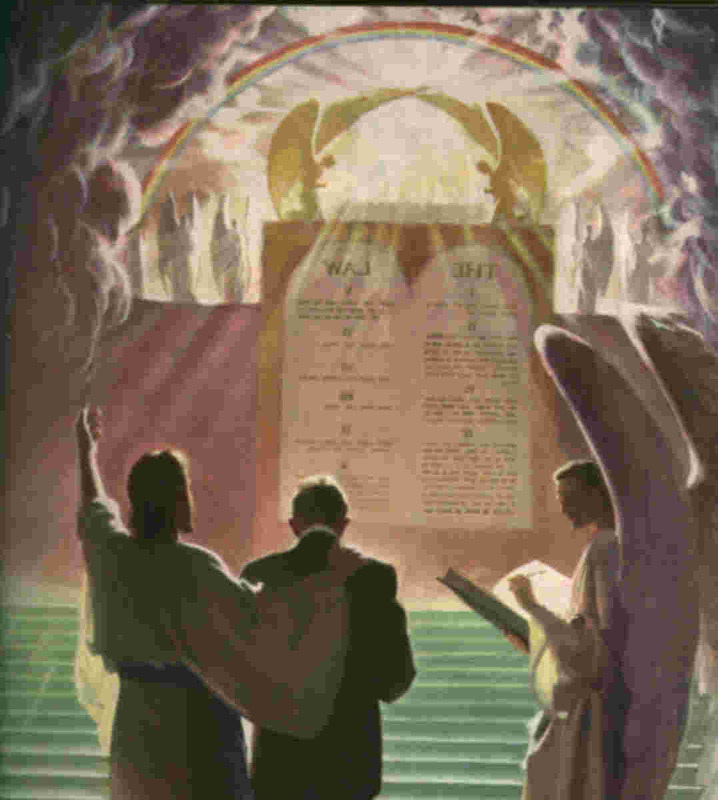 THE people of God” and His holy law were to be given into the hands of Rome. That is, the Lord in His wisdom permits Rome to become dominant and rule with cruel, despotic power, that the world and the universe of God may see the result of apostasy in the church of God, and of the church dominating the State. 5. THE period here mentioned is 1,260 years. A time, one year;times, two years; times is plural, hence more than one; and as the numeral adjective is not used, and as the orginal is dual in form, we know that “times” here means two “times,” or years; dividing of time, one-half a time would be understood, unless the number of parts was specified. (See also Dan. 12: 7; Rev. 12: 6, 14.) Hence we have three and one-half times, or years. This reduced to days, as the year was anciently counted, twelvemonths of thirty days each, would be as follows: One year, 3GO days; two years, 720 days; one-half year, 180 days; total, 1,260 days. (See Eev. 11:2,3; 12 : 6, 14; 13 : 5.) As this is prophetic time, and as these days, like the beasts, are used as symbols, we adopt the Bible rule of a “day symbolizing a year. (See Num. 14 : 34; Eze. 4 : 4-6.) These scriptures show conclusively the correctness of the above reckoning. Beginning with A. D. 538, when the papal supremacy was secured by the overthrow of the Ostrogoths, the 1,260 years would reach to 1798, the very year when its supremacy was broken. 6. A DEADLY wound was given to the Papacy in 1798, and its persecuting power was taken away. Still the pope was a civil ruler and exercised civil authority for many years, hut with lessening degree, till Sept. 20, 1870, when the last vestige of temporal power was stripped from him by Victor Emanuel. His temporal dominion was consumed and destroyed unto the end, that is, till the end of his dominion, till it ceased. It should be noticed that this refers to a gradual consuming of the dominion till it is gone, or destroyed, and not to the sudden destruction of the Papacy itself when Christ comes. 2 Thess. 2:8. Because the dominion of the Papacy is taken away or consumed until the end of the temporal dominion is reached, it by no means follows that its power will not be restored so that it will again persecute the people of God, for the Scriptures clearly teach that the deadly wound will be healed, and the Papacy will be a living, persecuting power when Christ comes, as already proved. 8. “ONE like the Son of man.” This is an expression used in symbolic prophecy in referring to Christ, the Son of God. We find it so used in Rev. 14 : 14. The student will notice that the coming brought to view in our lesson is not Christ’s coming to this earth, but His coming before the Father to receive His kingdom.